Derek Adams saluted ‘magnificent’ Plymouth after their comeback promotion-battle victory. And the Pilgrims boss felt his side restricted Pompey to few chances as his side picked up a massive 2-1 success at Fratton Park. Adams believes his team got their gameplan spot on as they gave their hopes of going up this season a shot in the arm with the three points. 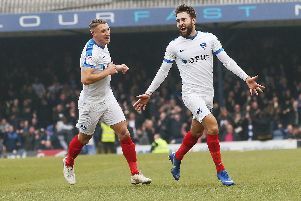 Michael Smith put Pompey in front in the first half but the Scotsman felt his side’s character then showed. Adam told the Plymouth Herald: ‘We lost a goal and then showed great character to come back. It was a magnificent performance. ‘We ground out a great win and a superb three points with two magnificent goals. To come away from here with three points is obviously very good for us. ‘Luke McCormick has really not had a save to make in the game and we just kept them quiet. Adams explained he paid attention to the threat Pompey offered from their full-backs pushing forward. He felt there was quality of offer from Pompey, but wasn’t overly worried by the threat posed. Adams said; ‘We had to stop them (Pompey) to start with because their two full-backs (Ben Davies and Enda Stevens) get forward. ‘We lost a poor goal from a quick throw-in. It was not really by them playing any good football through us. ‘It was a throw-in and a cross into the box. We could have dealt with it better but, overall, I was happy with the shape we had to the team. ‘This was a top-level game today between two very good sides. ‘There was some good football on show. It was tense at times because there were only five games to go in the season.